Does your child have extra energy? Some children naturally have more or less energy throughout their daily activities. We have the opportunity to notice when a child has some extra energy to burn at the end of their day. You may notice a child is having a difficult time sitting or laying down to wind down from the day This may include jumping on the bed/couch, running inside the house, wanting more play time, etc. and it’s close to bed time. You may feel tired and want your child to rest as well. Yoga can be used to calm the body down and also be used to burn some extra energy at the end of the day. 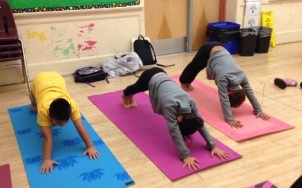 Kids can reap the benefits of yoga without having to be quiet and calm in the process. Try these five yoga poses with your child to help them burn some extra energy. 1. Down Dog with Jumping X’s- Have your child begin in table pose(on hands and knees). Press the weight into the hands and feet to lift the hips in the air to get into Down Dog. You look like an upside down V! Open the feet as wide as the mat. Jump the feet to cross the midline then jump them back out. Alternate the foot that crosses in front. Encourage your child to breath and make dog noises for every jumping X. Do 5 times for each foot. 2. Shooting Star- Standing up, have your child jump their feet out wide and spread their arms out like a letter ‘T’ to start in Star Pose. From Star Pose shift your weight into one foot and lift the other off the floor to balance. You can sing “Twinkle, Twinkle Little Star” together and alternate balancing feet OR balance 5-10 seconds on each foot. Alternate balancing feet 5 times. 3. Jumping Tree- Stand facing your child with 2-3 feet in between. Grab each other’s hands and place the right foot on the inside of the left leg to make a tree pose. Bend the standing leg slightly to begin small hops together. Jump 10-30 times then switch legs. Try counting or singing a song together while jumping. 4. Pretzel Pose with Hands to Heart- Sit facing your child in Pretzel Pose(Criss-Cross legs). Close your eyes and place your hands over your heart. Have your child feel their heart beat and count how many times they feel it beat. Do this for 20-40 seconds. Share how many beats you counted! 5. Mouse Pose- Sitting on the knees, fold forward into a ball, arms are along the sides. Place a stuffed animal or small pillow on your child’s back. Have them take in deep breaths so that they can “move” their animal up and down with their breath. Stay here for 5-10 deep breaths.